North Minneapolis has “a nutritional gap” that has been getting more attention recently. With Appetite for Change, Green Garden Bakery and Kindred Kitchen, there is now a market that has healthy food with a deli and bakery, fresh produce and daily cooked meat. North Market also addresses health services and concerns. 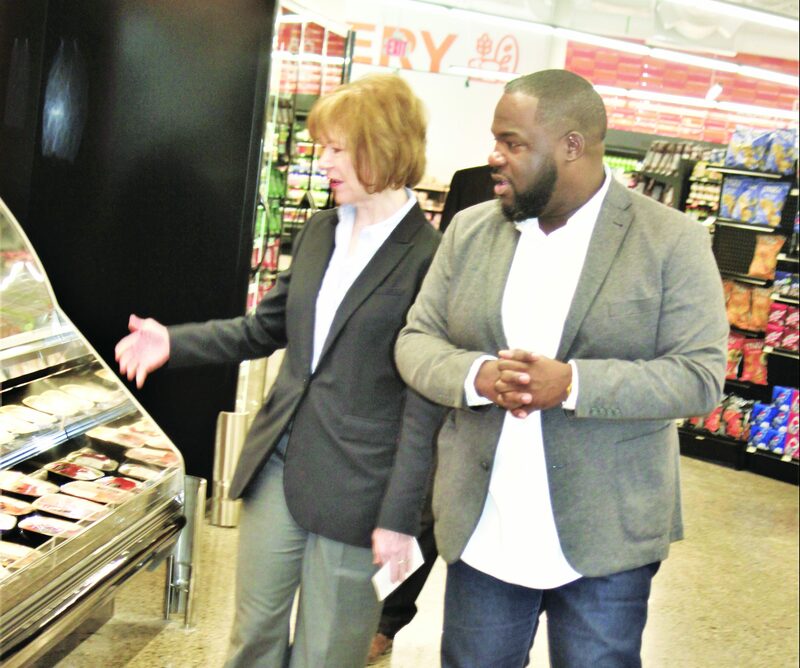 On February 10, Senator Tina Smith (D-Minn.), a member of the Senate Health Committee, visited North Market, an innovative North Minneapolis grocery store that opened in December 2017. The store supplies the local community with access to food and much-needed health and wellness services. The venture includes partnerships with North Memorial Health System. The organic grocery store is just a few blocks from Hamilton Manor, a senior housing complex on 44th Avenue. Some years ago, Metro Mobility provided bus services to Cub Food (some three miles away on Broadway), but that service was cut due to lack of funding. North Memorial Health System supports the wellness portion of North Market’s services. There are wellness coordinators, nutritionists, community health works and pharmacy liaisons on site to provide information and referrals such as health assessments, nutrition guidance, insurance and scheduling assistance, and medication management. In addition, Valerie Turner conducts a Zumba class at the market every Saturday. For more information, visit http://mynorthmarket.org or their Facebook page at My North Market. Ivan B. Phifer welcomes reader responses to ivan.b.phifer@gmail.com.